Definition at line 37 of file module.c. Referenced by testGetDllDirectory(), and testGetModuleFileName(). Definition at line 118 of file module.c. Definition at line 688 of file module.c. Definition at line 1017 of file module.c. Definition at line 904 of file module.c. Definition at line 462 of file module.c. Definition at line 950 of file module.c. Definition at line 588 of file module.c. Definition at line 130 of file module.c. Definition at line 185 of file module.c. Definition at line 710 of file module.c. Definition at line 291 of file module.c. Definition at line 883 of file module.c. Definition at line 203 of file module.c. Definition at line 277 of file module.c. Definition at line 306 of file module.c. Definition at line 226 of file module.c. Definition at line 32 of file module.c. Definition at line 49 of file module.c. Referenced by _get_checksum_offset(), build_exe(), check_exe(), CheckSumMappedFile(), create_fake_dll(), get_nt_header(), image_nt_header(), pe_load_nt_header(), Rva2Addr(), SdbpGetModuleType(), START_TEST(), test_FileMapping(), and test_WaitForInputIdle(). Definition at line 35 of file module.c. 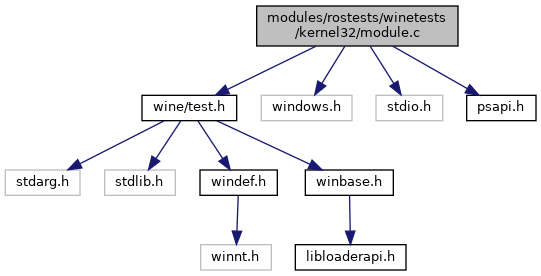 Referenced by START_TEST(), test_32bit_win(), testGetModuleFileName(), testGetModuleFileName_Wrong(), and testLoadLibraryEx(). Definition at line 26 of file module.c. Definition at line 27 of file module.c. Referenced by module_find_by_addr(), module_find_by_nameW(), module_get_containee(), module_get_container(), module_is_already_loaded(), module_is_container_loaded(), module_new(), SymEnumerateModulesW64(), SymFunctionTableAccess64(), SymGetModuleBase64(), SymGetModuleInfoW64(), SymUnloadModule(), and SymUnloadModule64(). Definition at line 50 of file module.c. Referenced by build_exe(), check_exe(), check_pe_exe(), create_fake_dll(), do_load_tree(), do_register_dll(), get_nt_header(), get_resource_section(), get_section_header(), ImageDirectoryEntryToDataEx(), MIDI_GetMThdLengthMS(), MIDI_mciFindNextEvent(), MIDI_mciReadMThd(), MIDI_player(), nfstime_abs(), read_mapped_resources(), reg_type(), shgfi_get_exe_type(), split_tree_at(), START_TEST(), test_import_resolution(), test_NtQuerySection(), test_thread_start_address(), test_WaitForInputIdle(), tree_concat(), tree_const(), tree_host_lookup(), write_metadata_items(), write_raw_resources(), xdr_nfstime4(), and xdr_settime4(). Definition at line 51 of file module.c.